The 25th Annual Putnam County Spelling Bee is a delightful, hilarious, and at times poignant look at a middle school spelling bee. I've seen the 2005 Tony-winning musical four times now, and I never tire of it. Bloomington Civic Theatre's new production is of course perfectly cast and very well executed, with Anita Ruth's small but still beautiful pit orchestra and Joe Chvala's unique eye for movement and direction. It's different than the large-cast traditional musicals they often do, which I love because it shows the full range of what musical theater is and what BCT can do. 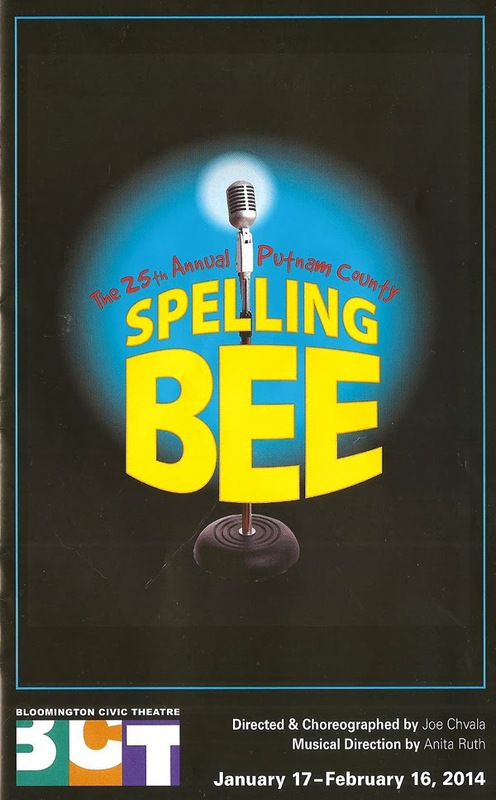 The entire show takes place within a spelling bee competition, with a few flashbacks or fantasies to help explain certain characters. But basically it's a spelling bee, following the spellers from the moment they arrive at the bee, through triumphs and defeats, to the crowning of the winner. 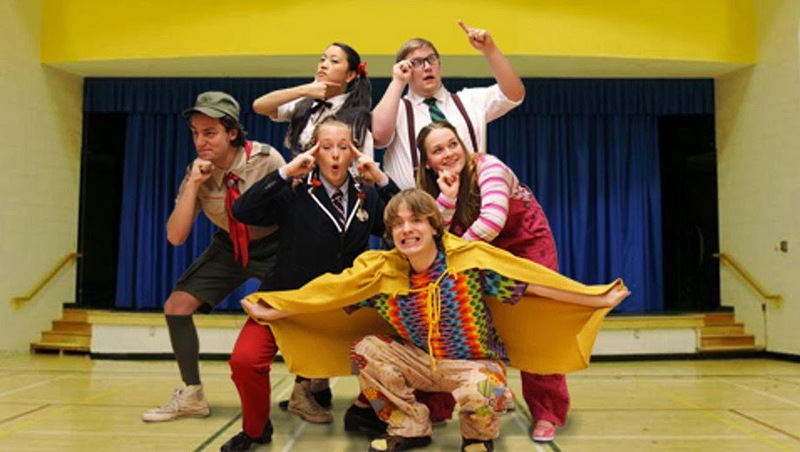 Along with the six quirky characters in the play, four audience members* are asked on stage to participate in the bee, adding an element of improvisation. Three adults try to wrangle the kids and keep the bee running smoothly, to varying degrees of success. Real life husband and wife Nicholas Leeman and Colleen Somerville play the adults presiding over the bee. Nicholas plays Vice Principal Panch with the perfect dry wit and occasional exasperation (and he's also the improv master as he deals with whatever the audience members throw him). Colleen's lovely voice is put to good use as former spelling bee champ Rona Lisa Peretti, with maternal fondness for the spellers and nostalgia for the bee. Not surprisingly, they have great chemistry, although Ms. Peretti does not return Mr. Panch's growing affections. As the bee's "comfort counselor," opera-trained Dominique Wooten cuts an imposing figure and can really belt (see also Les Miserables), and brings heart and humor to the paroled prisoner trying to help these kids deal with the disappointments of life. Six twenty-somethings convincingly play tweens and are all perfectly cast. Like she did in Carrie: The Musical for MMT last fall, Jill Iverson plays a complex and troubled teenager with a difficult relationship with her mother, but Olive is a bit lighter than Carrie and her story has a much less devastating outcome. Ryan London Levin is quite funny as former champ Chip, who's eliminated under unfortunate circumstances. Andrew Newman is adorable as the loopy and sweet Leaf Coneybear who knows he's "Not that Smart" (a role originated by Modern Family's Jesse Tyler Ferguson). Marcy Park is the least-developed character among the kids, but Hope Nordquist makes the most of her moment, a very active and busy "I Speak Six Languages." Andy Roemhildt plays all of the quirks of the singularly unique William Barfee to the hilt. Finally, Maisie Twesme is a standout as Schwartzy, with a lisp and a facial tic that never waver and a knack for engaging the audience spellers. The songs are mostly fun and light, with clever lyrics and catchy melodies. But occasionally the score is quite lovely and heart-wrenching; the musical highlight is the gorgeous three-part harmony in a fantasy sequence with Olive and her distant parents, with the three strong voices of Jill, Colleen, and Dominique blending beautifully together. This is an unusually small orchestra for BCT, but that's what the piece calls for, and as per usual it's spot-on. Joe Chvala's choreography captures the awkward movement of pre-teens, not quite in control of their bodies. I like to go to BCT on days when they have a post-show talk-back and listen to the cast and creative team talk about the experience. My favorite moment was when the cast was asked why they do this if they're not paid (much), and Ryan responded, "theater is crack!" As someone who saw over 150 shows last year, I heartily agree! As Anita pointed out in the talk-back, this sort of light comedic show is harder than it looks. It takes a lot of work to make the precisely timed comedy look as effortless and natural as this. If you've never experienced the unique delight of Spelling Bee, do yourself a favor and head out to Bloomington between now and February 16 (discount tickets available on Goldstar). And make your plans for next season at BCT which was just announced. It looks like another great one; I'm particularly excited about Next to Normal (which I've seen several times and love) and Carousel (a classic I've never seen but have been wanting to). *The audience spellers are given obviously easy or difficult words depending on if the script requires them to stay or leave. But they don't always comply, which is part of the fun. The cast told of someone who misspelled an easy word, which caused them to have to rearrange the song order. And there's always that one person who's a great speller and gets even the hardest words right. At the show I attended they finally had to trick him with to/too/two (which reminds me of the 30 Rock joke about the game show Homonym).